Is your dog left home alone all day? The idea of getting a dog can be difficult to resist; after all, who wouldn't want to be greeted by a friendly face when returning home at the end of a long day? But when you choose your pet it's important to consider how they will feel when you are away from home for many hours at a stretch. Some types of pet manage perfectly well but otherwise suffer when they are left on their own all day. We take a closer look at the stresses and strains suffered by pets when they are left alone all day. It can be easy to dismiss the stress that can be caused by leaving pets alone all day, after all when did you last see your Labrador wearing a watch? However, both dogs and cats have an internal body-clock and even though they may not measure hours and minutes in the same way as humans, they are aware of the passage of time. Pets can struggle living on their own. Scientists have suggested that animals use a variety of clues to help them to determine what is expected to happen and when. Some of these indicators may not be immediately obvious to humans but play a part in the way in which pets recognise time. What this means is that if you don't return home when expected, your dog or cat is likely to experience significant anxiety, even if they have plenty of toys, food and water. They may not be in immediate danger but they will be craving the most simple of things: your companionship. Of course, being late home is not the only time that your pet may feel agitated. Being away from them for long periods on a regular basis, such as going to work all day, can also create stress and strains. Of course it's essential for all animals to be provided with the right kind of companionship and social interaction, but for many dogs, their primary input may come from their cage mates rather than you. 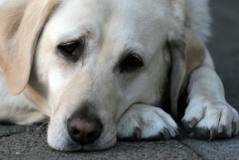 A quarter of the eight million pets dogs in the UK are estimated to be suffering from depression, caused by being left alone for long stretches at a time. It's far easier to spot problems in a dog that is destructive, chews furniture, defecates, barks or howls for long periods during your absence. All of these can be indicators that your pet pooch is struggling to cope when you are away for several hours. However, just because there is no obvious behaviour an outburst doesn’t mean that your dog is dealing well with your absence. Hidden cameras have picked up previously unseen behaviours such as relentless pacing, circling by the door, constant quiet whining or even self-mutilation such as chewing their paws. You might imagine that your dog enjoys the chance to kick back and relax without you there but far from spending the day chewing on their toys, napping and generally savouring their freedom all the signs suggest that your pet will feel distressed until your return. In fact, a recent study suggests that leaving a dog at home alone all day can result in an animal so traumatised that it is comparable to a child who has been abandoned by its parents. Coming home to find the house torn to pieces, accidents waiting for you on the living room carpet or even neighbours complaining about your dog barking all day may be the last thing you want to deal with after a long day at work. However, it's worth stopping to think about what might be causing those behaviours and whether your pet could be trying to show you just how much they are suffering. Even if your pet's behaviour seems immaculate, you might still want to consider how they are feeling when they are left alone during the day. A rapturous welcome home every evening might be lovely but is it really fair to leave your pet pining all day long? There are many resolves to this problem for example using a doggie day care service especially if you have an active puppy or hire a dog walker, a dog walker will come to your home usually in the middle of the day and take your dog for an hour long walk returning your dog tired out and ready to sleep during the afternoon. If you do opt for a dog walker be sure to check that they are insured, have had a criminal record check carried out and check out references to give you peace of mind. A trademark is a way to legally protect a brand or symbol and it shows that the item has exclusive properties and it belongs to the owner. This means it cannot be copied in the same form, at least not legally. The symbol used to indicate ownership of the item is ™, and if this has been officially registered it is a Registered Trademark which then has the symbol ®. The difference between these two forms of protection is that a ‘TM’ is a simple trademark, and while this can be registered with local authorities or be in the process of being officially registered, it does not offer as much protection as a Registered Trademark which has been officially registered – and accepted – by the national patent office. A trademark shows a product belongs to one source, and a good trademark makes the company easily distinguishable, (think of McDonald’s big ‘M’). Any new logo, name or symbol designed and developed by a person or company can have the ‘TM’ symbol, but unless it is officially registered a competitor can and may produce something similar, (or even the same), and while the ‘TM’ article was the first on the market, this is not always easy to prove without the further proof of registering it. Once registered, another company cannot produce the same item using the same name and logo, so it protects the manufacturer or inventor much more than the unregistered TM. Basically ‘TM’ suggests the item belongs to someone, while ® shows it to be legally the property of another, that is the reason registering your Trademark is a good idea. You are legally protected and your brand is as safe from imitations as you can make it. If someone does set out to copy your Registered Trademark, you can legally prove this is a copy and potentially damaging to your business.